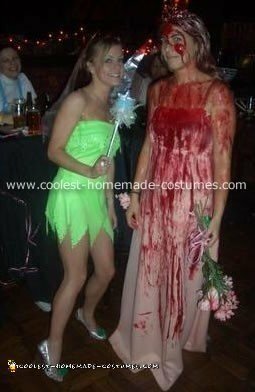 A few months before Halloween 2005 I happened to catch Carrie on TV and thought, “what a great, gory costume that would be.” As the day drew closer I just couldn’t get the idea out of my head for a Carrie costume and decided to go for it. I paid $10 for an old bridesmaid’s dress at a thrift store (although I did have to take it in a lot), bought a Farrah Fawcett wig, tiara, and fake flowers which I used as a bouquet and corsage. I bought a ton of stage blood and prepared everything ahead of time. I put on the dress and stood in my shower while my friends covered it in the blood. Then they took it and hung it up to dry while I rinsed off. (By the way, stage blood is very realistic and it is quite disturbing to watch it washing down the drain!) I put the wig on a wig form and covered that in blood too. I really wanted to be sure it looked as if a bucket had been dumped on my head, so I made it heavier on top and more separate towards the bottom. We did the same with the dress. I also made sure to douse the flowers, tiara and corsage. Doing everything ahead of time was crucial. This is a very messy costume and I didn’t want to get blood all over everything. To do my face and arms I used a coagulated stage blood that is more gel-like, so it stays in place but doesn’t get all dry and flaky when it sets. I have never had more fun in any costume. The reactions I got from people were amazing. Total strangers were approaching me for pictures, my friends were completely freaked out and it was clear i had the best costume in the room. The downside? I was cleaning up ‘blood’ for weeks and weeks. Awesome idea!!! It looked great!! Carrie costumes are the best love the costume it’s so scary ah!ah! lol love the costume bye he way where do u get the blood I’m gonna scary my mates ha ha ha. How early ahead of time did you apply the fake blood. I’m doing Carrie this year and this is my first attempt at using fake blood. I’m not sure how early I can prepare my outfit with out the blood looking bad.